The mode or manner or orderly sequence of events of a process or procedure. See also: fixative, operation, procedure, stain, technique. /meth·od/ (meth´od) the manner of performing any act or operation; a procedure or technique. dye dilution method a type of indicator dilution method for assessing flow through the circulatory system, using a dye as an indicator. indicator dilution method any of several methods for assessing flow through the circulatory system by injecting a known quantity of an indicator and monitoring its concentration over time at a specific point in the system. Lamaze method a method of preparing for delivery, involving education of the prospective mother in the physiology of pregnancy and parturition as well as in techniques such as breathing exercises and bearing down for the easing of delivery. rhythm method a method of preventing conception by restricting coitus to the so-called safe period, avoiding the days just before and after the expected time of ovulation. Westergren method the most common method for testing the erythrocyte sedimentation rate, measuring the timed fall of the level of red cells after mixing whole blood and sodium citrate anticoagulant-diluent solution. Yuzpe method a regimen for postcoital contraception, consisting of a combination of ethinyl estradiol and norgestrel taken twice, 12 hours apart. a technique or procedure for producing a desired effect, such as a surgical procedure, a laboratory test, or a diagnostic technique. The manner in which a particular thing is performed. Medtalk The manner in which a particular thing is performed. See Cold turkey method, Comparative method, Confidence profile method, Confirmation method, Contrast-enhanced method, Delphi method, Designated comparison method, Diary method, Direct fluorescent antibody method, Empirical method, Heuristic method, Immunoperoxidase method, Micro method, Natural experiment method, Parametric method, Pisano method, Reference method, Rhythm method, Sandwich method, Shotgun method, Socratic method, Street intercept method, Substitute method, Time sampling method, Unproven method for cancer management, Valid method, Validated method, Westergren method. The orderly sequence of events of a process or procedure. n a systematized means for accomplishing a purpose. n an osteopathic manipulative technique in which the patient performs motions directed by the physician. n a technique for processing glandular extracts in which the material is frozen, purified with a strong solvent, distilled, dried, and crushed into a powder. n 1. an osteopathic treatment that begins with indirect movements and then switches to direct forces as the technique is completed. 2. an osteopathic treatment that combines two or more different techniques. n.pr a “pinching” technique developed by James Cyriax to promote stretching and relaxation of tissues and to decrease the amount of blood within the tissue. n psychotherapy practiced on the foundations of acupuncture meridian theory; also employs music, visualization, song, thought recognition, and core belief analysis to correct psychologic and psychoenergetic problems. n any osteopathic treatment in which the affected physical component is moved beyond the range of voluntary motion, away from the restrictive barrier, to a point where the patient feels increased tension. n.pr therapeutic learning approach in which participants learn functional movement and self-awareness through sensory experiences. Taught one-on-one and in large class settings. Helps participants discover natural, intuitive movement. n an indirect osteopathic technique in which the physician locates the dynamic balance point, to which is applied one of the following techniques: applying indirect guiding force, holding the position, or exaggerating the position through added compression. This is done to decrease the sense of tissue resistance. n in traditional Chinese medicine, therapeutic approach that involves warming the air inside a glass, metal, or wooden cup and inverting it over a part of the body to treat various health conditions; animal horns, from which the method derives its name, were used originally. n.pr the five-step, energy-based therapeutic method formerly called therapeutic touch. The five steps are centering (calming the self and client to a point of open readiness), assessment (discerning the symmetry of the energy fields surrounding the client), unruffling (the practitioner moves his hands in a clearing motion to the edges of the client's energy field), and directing and modulating energy (the practitioner channels and transfers energy to the client). n.pr a technique used for relaxation in which one assumes body postures opposite to those related to stress and anxiety. Morrell Reflexology. See also reflexology. n Hahnemann's process for developing homeopathic remedies; uses a clean glass receptacle for each successive dilution. See also potency, Hahnemannian; potency, Korsakov; and method, single glass. n a meridian-based procedure in which a patient is instructed by the practitioner to recall a traumatic event and then is systematically tapped on specific points of the body to resolve the trauma. n in a pulse examination, a thorough diagnostic method that uses nine standard locations to examine the pulse. These nine locations consist of three points at each section of the body (upper—the head, center—the hands, and lower—the feet) and three points per section—one each for heaven, man, and earth. See also pulse examination. n osteopathic technique in which the patient does not engage in any voluntary contraction of the muscles. one with each exhale. Used to create an awed relaxed state. n.pr somatic education method created by Marion Rosen in which easy, deliberate body movements are set to music to improve flexibility, alignment, and range of motion. They also ease breathing, and deepen awareness of the body. May be performed individually, with partners, or in a circle. n technique for processing glandular extracts in which the glandular material is soaked in salt and water and then separated into high-density, water-soluble material and low-density, fat-soluble material by centrifugation. The water-soluble material is then dried and crushed into a powder. n procedure for developing potencies in one glass receptacle only. Fluxion is a form of this procedure. See also potency, Korsakov and fluxion. n in a pulse examination, a diagnostic method that is used in emergencies. The three points are the ren ying (near the Adam's apple), the cun kou (wrist pulse), and fu yang (instep) points. See also pulse examination. n.pl 1. relaxation techniques that can be used effectively with little or no practice. Deep breathing and paced respiration are examples. 2. in psychotherapy, abbreviated therapeutic approaches often used in crisis situations or when long-term therapy may be inappropriate. n.pl relaxation techniques that often take time and practice to cultivate. Autogenic training, meditation, and progressive muscle relaxation are examples. n.pl in Chinese traditional medicine, four diagnostic methods—inspection, olfaction, auscultation, inquiry, and palpation—used to collect patient information. A systematic procedure or process used for attaining a given objective; for example, doing an examination or an experiment. See procedure. 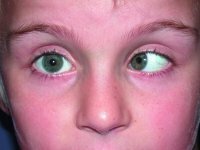 Bruckner's method An objective method of detecting the presence of strabismus. The examiner illuminates both eyes of the patient simultaneously with an ophthalmoscope from a distance of about 1 metre. Looking through the ophthalmoscope the examiner focuses on the fundus reflexes seen in the two pupils. If one pupil appears brighter it is considered that this eye may be strabismic and perhaps amblyopic. The reason may be due to the fact that this eye will be deviated and optical aberrations will make the pupil area appear brighter and whiter. The examiner may also note the position of the corneal reflexes when carrying out this test. This test is more reliable when patients are wearing their correction. Syn. Bruckner's test. See Hirschberg's method. cross-cylinder method See cross-cylinder test for astigmatism. Donders' method See push-up method. Drysdale's method A method that has been applied for the determination of the radius of curvature of hard contact lenses. 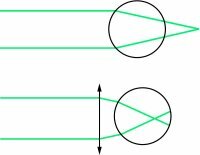 The principle consists of placing a light source in a modified microscope in focus at the surface of the lens and at the centre of curvature of the surface, the distance between the two being recorded on a dial as the radius of curvature. See back optic zone radius; Radiuscope. duochrome method See duochrome test. fogging method Method of relaxing accommodation during the subjective measurement of ametropia. This is achieved by placing enough plus lens power (or less minus lens power) in front of an eye to form an image in front of the retina. In this condition, any effort to accommodate will produce a poorer image and relaxation of accommodation is thus achieved (Fig. M8). Then, plus lens power is decreased (or minus lens power increased) until the patient reports no further improvement in visual acuity. This point represents the maximum positive lens power (or minimum negative lens power) and it is called the best vision sphere (BVS). See refractive error; fan and block test; plus 1.00 D blur test. von Graefe's method See diplopia test. van Herick, Shaffer and Schwartz method A technique for estimating the angle of the anterior chamber. It is based on the fact that the width of the angle of the anterior chamber is correlated to the distance between the posterior corneal surface and the anterior iris as viewed near the corneal limbus. This is done using a slit-lamp with a narrow slit beam perpendicular to the temporal or nasal corneal surface, viewing from the straight-ahead position and comparing the depth of the anterior chamber to the thickness of the cornea. If the AC depth is equal to or greater than the corneal thickness, the angle is considered to be grade 4 (corresponding to a wide open angle). If the AC depth is equal to one-half the corneal thickness, the angle is considered to be grade 3 (this is the most common angle width). If the AC depth is equal to one-fourth the corneal thickness, it is considered to be grade 2, and if the AC depth is less than one-fourth the corneal thickness, it is considered to be grade 1 (corresponding to a very narrow angle). Grade 0 is considered to be a closed angle. The method is most useful for predicting the possibility of angle-closure glaucoma. The results of this method are in good agreement with those of the Shaffer classification using a gonioscope. Syn. van Herick's technique. See gonioscopy; shadow test. Hirschberg's method Method for estimating the objective angle of strabismus. The examiner's eye is placed directly above a small penlight source fixated by the subject and observes the position of the corneal reflex of the deviating eye. The angle of strabismus can be estimated on the basis that each mm of deviation, relative to the corneal reflex in the fixating eye, represents approximately 7º (12 Χ) of strabismus (Fig. M9). Syn. Hirschberg's test. See Bruckner's method; Krimsky's method. Humphriss method Method of binocular subjective refraction in which the eye not being refracted is blurred by means of a +0.75 D (or +1.0 D) spherical lens above the correcting lens. This lens produces a suppression of foveal vision while allowing peripheral fusion to maintain binocular alignment of the two eyes during refinement of the correction to the other eye. Syn. Humphriss immediate contrast test (HIC). However, HIC differs somewhat from the above method because it relates only to one specific procedure: a +0.25 D sphere is followed by a −0.25 D sphere in front of the unfogged eye and the patient has to indicate which is the clearest. The above method can be used for many types of refractive procedures. See refractive error; balancing test. Javal's method Method for determining the objective angle of strabismus using a perimeter. The patient is seated before a perimeter arc with the deviating eye at the centre of the arc while the other eye fixates a distant point straight ahead. The examiner moves both a light source and his eye directly above it, until the corneal reflex appears centred in the entrance pupil of the deviating eye. The position of the source on the arc can be read to give the objective angle of strabismus. Angle lambda must be added in convergent and subtracted in divergent strabismus as the criterion used was the pupillary axis, which makes an angle with the line of sight. Strictly speaking, angle kappa, rather than lambda, should be taken into account. See angle of deviation. Krimsky's method Method used to determine the objective angle of strabismus. The examiner's own eye is placed directly above a small penlight source fixated by the subject and observes the position of the corneal reflexes. Prisms are placed in front of the deviating eye until the examiner finds the prism power that makes the corneal reflex appear to occupy the same relative position as that in the fixating eye. Syn. prism reflex test. See Hirschberg's method. minus lens method Method of measuring the monocular amplitude of accommodation which consists in placing minus lenses in front of one eye while the subject fixates the smallest optotypes (usually subtending about one minute of arc, that is the 6/6 or 20/20 line). Progressively stronger lenses are used until the patient reports that the test appears blurred. The determination of the amplitude must take into account the vergence at the eye of the fixation point and the test must be carried out with the patient's distance correction. If the minus lens to blur is −4 D and the fixation distance 40 cm, the amplitude will be equal to 6.5 D. See subjective accommodation. preferential looking method (PL) A method of assessing visual acuity in infants. It consists of presenting two stimuli on a uniform background, one of which contains a pattern (e.g. a checkerboard or a grating) and the other a plain field of equal shape, size and luminance, and observing the infant's eyes. If the infant can resolve the pattern he or she tends to fixate that stimulus for a larger percentage of time. By reducing the size of the detail in the pattern, a threshold can be obtained when the infant fixates at either stimulus for the same length of time. See objective visual acuity; Teller acuity cards; Cardiff acuity test. push-out method See push-up method. push-up method Method of determining the near point of accommodation by moving a test object (made up of small optotypes subtending one minute of arc (that is the 6/6 or 20/20 line) at the eye and uniformly illuminated) closer to the patient's eye. It is usually done monocularly and then binocularly. The near point is achieved when the small test object yields a sustained blur and not just begins to blur. Alternatively, the card is moved back after appearing blurred until the small test object just appears to clear again. This is often called the push-out method. In older patients, plus lenses may be needed to carry out the test and the power of the lens is subtracted from the reading. The amplitude of accommodation is deduced by taking into account the vergence at the eye of the far point (it is at infinity in emmetropes and corrected ametropes). Syn. Donders' method. See amplitude of accommodation; near point rule. Smith's method A method of estimating the depth of the anterior chamber. It is performed with a conventional slit-lamp. The angle between the illumination beam and the microscope, which is placed along the straight-ahead position, is set at 60º. To examine the patient's right eye the examiner looks through the right eyepiece and through the left eyepiece to examine the left eye. A beam of moderate thickness is oriented horizontally and focused on the cornea. Two horizontal images of the slit will appear separated by a dark space one sharply focused corresponding to the cornea and the other out of focus corresponding to the anterior lens surface. The slit is lengthened until the two separate reflections just touch. At this point the length of the slit is measured and multiplied by a factor of 1.4 to arrive at an estimate of the depth of the anterior chamber. The method gives optimum results within the range of 1.4 mm and 3 mm. It is most useful in assessing shallow chambers as this could lead to angle-closure glaucoma. See shadow test. method of stabilizing the retinal image See stabilized retinal image. n a manner of performing an act or operation; a technique. n.pr a method of toothbrushing in which the brush is held horizontally, with the bristles lying against the teeth and gingivae and pointed in a coronal direction at 45 degrees so that the bristles lie half on the teeth and half on the gingivae. A vibratory cycle of a very constricted diameter is negotiated so that the brush head moves in a circular movement but the brush bristles remain fairly stationary while being agitated. The circular vibration loosens debris and pumps the bristles into interproximal areas to massage the tissues. n (Callahan's method, Johnston's method), the method of filling root canals in which gutta-percha cones are dissolved in a chloroform-rosin solution in the root canal. The canal is flooded with the chloroform solution. A preselected gutta-percha cone is then pumped carefully into and out of the canal. As the cone dissolves, the material is forced into the apex as a plastic mass. Other cones and occasionally additional chloroform solution are added until the canal is sealed. n.pr (Fones' technique), a toothbrushing technique in which, with the teeth occluded and with the brush at more or less right angles to the teeth, large sweeping, scrubbing circles are described. With the jaws parted, the palatal and lingual surfaces of the teeth are scrubbed using smaller circles. Occlusal surfaces are brushed in an anteroposterior direction. n.pr a toothbrushing method in which the bristles are placed against the axial surfaces of the teeth, with slight incisal or occlusal inclination from a right-angled application, in simultaneous contact with teeth and gingivae, and then rotated in a circle of exceedingly small diameter. Occlusal surfaces are brushed energetically. n.pr a method of artificial respiration. The patient is placed on the back, with the hands under the head, and a cushion is placed so that the head is lower than the abdomen. The physician applies rhythmic pressure upward and inward with the hands against the lower lateral parts of the patient's chest. n.pr a method of depositing silver in enamel and dentin by the application of ammoniacal silver nitrate solution and its reduction with formalin or eugenol. n the technique of fabrication of a restoration on a cast or model of the original (e.g., the indirect method of inlay construction, in which a die of amalgam or other material is made from an impression of the prepared tooth, a wax pattern is formed, and the cast inlay is fitted and finished on the die and then cemented to the tooth). n the method in which a preselected gutta-percha cone is sealed into the apex of the root. The balance of the space is filled with other gutta-percha cones forced laterally with a spreader. 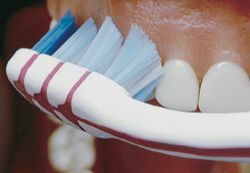 n.pr a toothbrushing technique characterized by the placement of the toothbrush head against the gingiva, vibrating it, then rolling the bristles over the rest of the tooth's surface. Each stroke is repeated five times for each section of the oral cavity. n a method of scheduling appointments in which the patient schedules the next appointment while checking out from the current one. A reminder postcard is filled out at this time, to be mailed later, or an e-mail reminder is stored. n a simple, introductory toothbrushing technique that does not include brushing of the gingival sulcus. Often taught to children as a precursor to the modified Stillman method, or as a preliminary framework for a more advanced technique incorporating vibration of the brush. n the method in which a preselected gutta-percha cone is cut into segments. The tip section is sealed into the apex of the root. The other segments are usually warmed and condensed against the first piece with a plugger. Additional pieces are then used until the space is obliterated. n the method in which a prefitted silver cone is sealed into the apex of the root canal. The space not sealed with the cone is obliterated with gutta-percha or sealer. n.pr a toothbrushing technique referred to as physiologic, in which the brush strokes mimic the path taken by food when it is chewed. P represents the actual patient care plan. n 1. a procedure for checking the ability of an articulator to receive or to be adjusted to a maxillomandibular relation record. n 2. a procedure for indexing casts on an articulator to facilitate their removal and replacement on the instrument. n.pr a toothbrushing technique that incorporates gingival stimulation and dental cleansing, in which the toothbrush is held against both the gingival and the dental surfaces and manually vibrated. procedure for carrying out a particular task, e.g. investigating a hypothesis. when a particular factor is common to all occurrences of the disease, it may be that the common factor is the cause of the disease. when the circumstances of occurrence in one disease are similar to those in which another disease occurs, the diseases may come about in the same way even though the causes are different. when variation in the frequency of the disease is mirrored by a similar variation in the strength of a particular agent which may be the cause. when there are wide differences in the rate of occurrence of a disease and a high frequency is accompanied by the presence of the suspected cause and a low frequency by its absence. a method for establishing the population density of a particular species of animal or plant. One of the units is identified and the distance to its nearest neighbor of the same species measured. The number of units of that species in an area can then be established, the accuracy increasing with the number of measurements made. Q. What are the screening methods for autism? I have a friend who has an autistic child. My daughter is 5 months old and I was wondering if there are any screening methods that help determine autism. A. The general screening methods for autism are used by parents and pediatricians to evaluate a child’s irregular behavior for his/her age. As a parent, if you see any regression of the child- for instance, he was able to say mom and now he doesn’t say it anymore, or if a child hasn’t started speaking when they should. Those are reasons to go see someone about the possibility of autistic disorder. Q. What Are the Methods of Terminating a Pregnancy? What ways are there today to end an unwanted pregnancy? A. "If you're not ready for it, don't have the economic ability to feed it or cant raise it in the conditions he deserve" then it would be even better to have the child and give it up for adoption. There are so many married couples who can't have a child any other way and really do want one to love and cherish.